Distraction-free writing is harder than you think. With YouTube open on one tab, Instagram only a pocket-grab away and countless other distractions around your home and office, getting the focused time you need to complete an important piece of writing isn’t exactly a breeze. There are many different ways you can embrace distraction-free writing and work towards your writing goals. The right combination of healthy workflows and high-quality writing tools will carve your route to success, and of course, a dose of motivation and positivity goes a long way. Putting some of these tips into place will help you to start thinking distraction-free and get into the right mode to achieve your daily writing goals. The majority of people across the workday are juggling too many tasks and activities and get distracted by their colleagues, short visits to Facebook and even themselves. So how can one balance everything, whilst retaining focus on work?! Reduce multi-tasking. Yes, you heard that right. No more rallying up tasks to do all at once, just focusing solely on one task at hand will suffice. This is known as mono-tasking, something many professionals are adopting as part of their workday routine to help reduce the pressure of being on three or four tasks at once. The stress of working on many projects won’t help your efforts to get a distraction-free period of time to write. Focusing on one piece of writing or even one section at a time will help to complete an article or piece of work much more smoothly and provide faster results in the long-term. Now you’ve assigned one task to work on, it’s time to address the external invasions of your time and attention. Speak with your colleagues before you start a task and agree to only chat via team communication tools until after completion of the item. As for distractions caused by yourself, skip ahead and try the Pomodoro Technique, this will help you to avoid unfocused browsing or tempting distractions around you as you complete a task. A good workman never blames his tools, but in today’s modern society, with a plethora of tools at hand, it’s hard not to. Even more advanced, distraction-free writing has been made possible in the last 5 years with cleaner, more fine-tuned applications to reduce any interruptions. One tool that stands out is Ulysses. 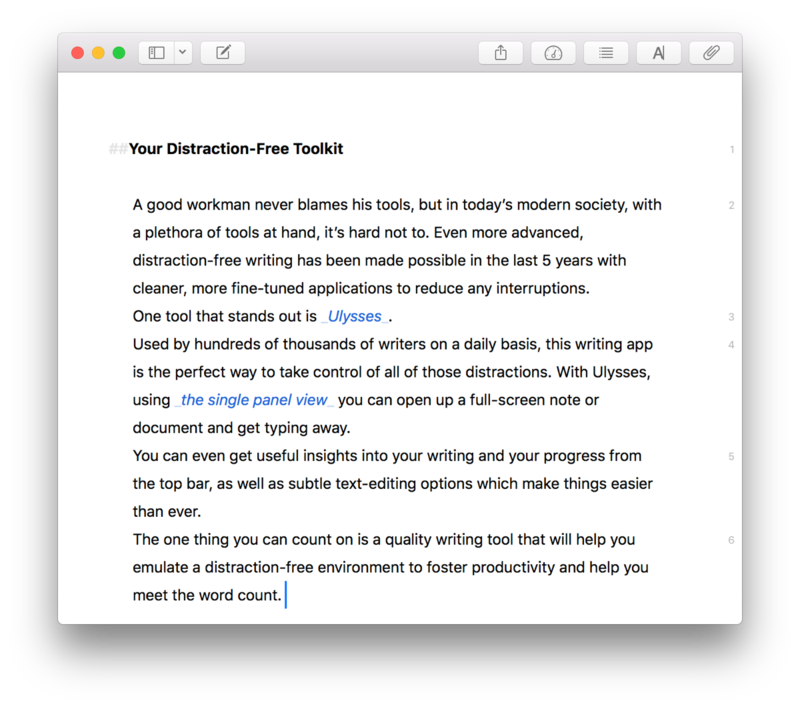 Used by hundreds of thousands of writers on a daily basis, this writing app is the perfect way to take control of all of those distractions. With Ulysses, using the single panel view you can open up a full-screen note or document and get typing away. You can even get useful insights into your writing and your progress from the top bar, as well as subtle text-editing options which make things easier than ever. The one thing you can count on is a quality writing tool that will help you emulate a distraction-free environment to foster productivity and help you meet the word count. One of the more common stories writers have is being able to write very well in coffee shops and other environments that help to trigger a procrastination-free or focused mode of their work. Now, you may not have a coffee shop to hand or even could be trapped in an office, with earphones, but it’s possible to recreate that experience, no long walks needed. 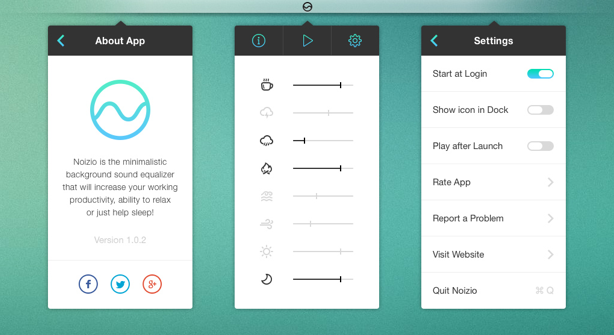 Noizio provides a tuner for background sounds. Giving you a way to tune into a coffee shop, a rainy day and many more environments providing a sense of being there. It’s perfect for those who work with background noises and can use that to produce optimum results. Once you’ve got your desk all cleared, your focus on one task and Ulysses set-up, it’s time for writing. But how can you keep a strong focus without getting distracted?! The Pomodoro Technique is one of the most popular ways to stay on track with a certain task or activity and can work wonders for writers looking to post in their best results each day. The method is simple. Blocking time of 25-minutes with a 5-minute break. 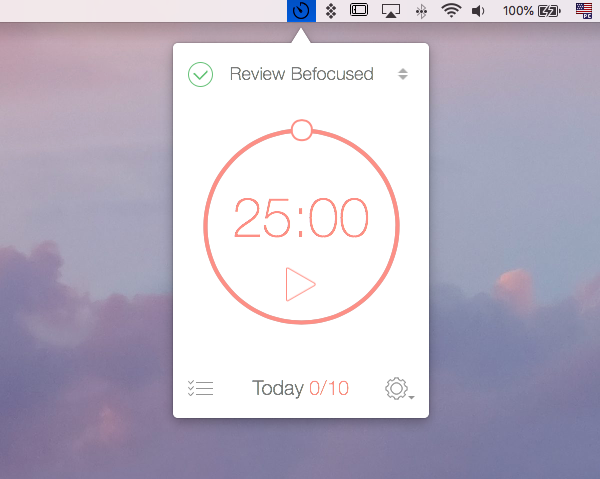 With the help of a timer, during these 25-minutes, you begin focusing on one task. After the 25-minutes, you break out and take 5-minutes to recover or relax. We’ve put together a full guide on Pomodoro Technique here. This very simplistic method provides you with a focused period of time to work and allows you to schedule in breaks, giving you the opportunity to relax and reduce burnout. This is loved by many distraction-free writers! Using a Pomodoro timer like Be Focused on Setapp can help you to get started with the Pomodoro Technique, we promise you’ll never look back! For many people, writing is a fun and interactive activity, but with all things, you can get tired and dreary and stressed, naturally. One of the things to note is making sure you don’t punish yourself too much if you have a poor writing session or can’t quite get into the writing mode for the day. There have been countless times this has happened for writers, from novices to professionals. The best way to handle this is taking some time out. Whether that’s grabbing a cup of tea or coffee, going on a stroll around the block or even calling a friend. A simple 5-10 minute activity might help to re-ignite your writing spark and kick the momentum back off. Remember you aren’t a robot, so don’t worry if you have bad days. You need a workspace that screams distraction-free. As you start writing, your eyes will be scanning your close proximity looking for distractions and cleaning your desk might be the first procrastination activity to start with. The decluttering of your desk can bring huge benefits to your working routine as well as the quality of your writing sessions. Starting off with a clean desk will help to reduce stress in your mind. Research from Reliable Plants, indicates that the average worker wastes around 4.3 hours per week finding paper across the desk. This wasted time finding the scraps you need boils down to a less productive writing time and more stress on your behalf. A clean desk will help to improve your writing experience and bring you a lot more focus. There are a host of ways to write distraction-free, so our final tip would be to keep connected with a writing community or local club for writing. The chances of you picking up some useful tips from the professionals or those similar to you will help to grow your insights and become active habits in your writing routine. Let us know in the comments below what writing tips you’d have to keep on track and distraction-free! To know more about hot to get things done, follow Keep Productive channel. You’ll find regular tips and well-researched advice on better performance and focus.